What is a FOID card? The FOID card was created in 1968, by the FOID Act, as a way to identify those persons eligible to possess and acquire firearms and firearm ammunition as part of a public safety initiative in the State of Illinois. Unless specifically exempted by statute, any Illinois resident who acquires or possesses firearm or firearm ammunition within the State must have in their possession a valid Firearm Owner's Identification (FOID) card issued in his or her name. Can a person who has been convicted of a felony in the state of Illinois ever be eligible for a FOID card? Applicants who have been convicted of a felony are ineligible to receive a FOID card. However, an appeal procedure is available in accordance with 430 ILCS 65/10. Contact the ISP Firearms Services Bureau at (217) 782-7980 for further information. Is a person who has been convicted of domestic battery/ domestic violence eligible for a FOID card? According to Federal and State laws, anyone who has been convicted of domestic battery/ domestic violence is ineligible to possess a FOID card. This prohibition also applies to police officers and those in the military. Contact the ISP Firearms Services Bureau at (217) 782-7980 for further information. If a person is subject to an active Order of Protection, are they eligible for a FOID card? According to Federal and State laws, anyone who is subject to an active Order of Protection may be ineligible to possess a FOID card. Contact the ISP Firearms Services Bureau at (217) 782-7980 for further information. August 2007 The alledged unreported gun incident fired from the Peterson's master bedroom above garage in August 2007 that almost hit Stacy fetching a soda from refrigerator in the garage directly below. "Stacy Peterson's sister talks about gunfire"
MIKE PUCCINELLI: "Tonight Stacy's Sister, Cassandra Cales is speaking out about it. Drew Peterson is also weighing on that story on the same day his lawyer went before a judge in Will County to argue that police should be foreced to return some of Peterson's property. Among the items they want back, two cars and eleven guns, one of which may have been fired inside the Peterson home." Cassandra Cales is talking about the time she says her sister Stacy Peterson told her she was almost shot in her home. Cales said it happened just a few months before her sister disappeared." CASSANDRA: "She told me that Drew's gun had went off while she was in the garage getting a soda when he had come home from work. And she peeled the carpet opened and showed me a bullet hole through the floor." Cales said her sister had gone to the garage at the request of her husband." CASSANDRA: "She heard a bang or pow or didn't know what happened and when she went back upstairs Drew said his gun had went off." MIKE PUCCINELLI: "Drew Peterson says quote, "It was an accidental discharge of Stacy's firearm. I'm not even going to tell you who did it. It was a stupid mishap in the home. No one was close to being hurt.]" - "But Cales said that's not what her sister determined after she examined the bullet hole in the garage floor." PUCCINELLI: "And how close was she to getting hit?" CASSANDRA: "It was probably about a foot behind where she was standing." PUCCINELLI: "Cales said she's talking about the incident because she's hoping it will effect the investigation on whether the retired Sgt. gets to keep his $6,000 a month pension. Peterson's former neighbor, Steve Carcerano said Drew Peterson told him it was actually Stacy Peterson who fired the weapon. Illinois State Police are investigating. Bolingbrook Police say departmental rules require that officers report any discharge of a weapon whether or not they are on duty at the time. No report was filed in this case." Drew never reported the shooting and patched ceiling ILL 12/11/2007 (Chicago Tribune) Stacy Peterson's sister tells of gunshot in home"
"She [Stacy] heard a pow. It scared her. 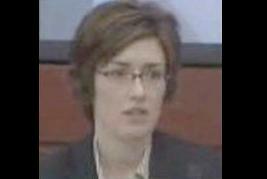 She looked around the garage—she didn't know what it was," [Cassandra] Cales told the Tribune on Tuesday [12/11/2007]. "Drew went down there. He picked up all the pieces and he never made a report [to police]. He patched the ceiling. Stacy showed me the hole. She peeled the carpet back and showed me where the hole was." Cales said she sarcastically asked Stacy if the gunshot was an accident. She said her sister just stared at her. Cales said the gun incident happened in August ." "Nothing says I love you like a Glock." 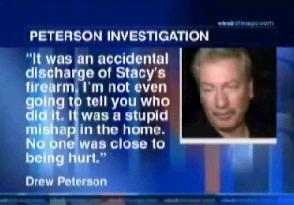 ILL 12/12/2007 (Chicago Tribune) "Peterson says wife shot gun"
"Drew Peterson on Wednesday [12/12/2007] said a gunshot in his home in the summer resulted from his wife, Stacy, accidentally firing the handgun he gave her as a present. "It was an accidental discharge—in my home by Stacy," Peterson said in an interview at their Bolingbrook home. "She had a fascination with guns. I bought her a Glock for Valentine's [Day]—because nothing says I love you like a Glock. That was our joke." December 11, 2007 Cassandra told Bolingbrook PD about gun incident ILL 12/11/2007 (Chicago Tribune) Stacy Peterson's sister tells of gunshot in home"
"[Cassandra] Cales said she told Illinois State Police and Bolingbrook Police Chief Ray McGury about the gun incident when she reported her sister missing. Bolingbrook police Lt. Ken Teppel said McGury told Cales to report it to state police. "He did say that Cassandra brought it up. . . . We had no report of that either by Stacy or by Drew," Teppel said. "He recognized that it was integral to this investigation and told her to make sure Illinois State Police is aware of it." "Mims stayed in the house while cadaver dogs went room to room sniffing fo Stacy's body. Police took all the linens off the bed in Dw and Stacy's bedrom, and they confiscated carpet cleaner, computers, toothbrushes and Drew's guns. When Drew got home in the afternoon, Mims met him at neighbor Sharon's house as the police finished the search. Later that night inside the house, Drew showed Mims a gun he'd hidden, a small pistol that folded in half. "They (the police) didn't find this one," Drew sneered." Internet Forum posting found from unknown individual Molested in the 70's? sister took Peterson's pistol! ILL scaredmonkeys.com posting, Thread, "Stacy Ann Peterson Missing, Sgt. Drew Peterson … One Wife Missing, One Wife Dead", 12. Mike on November 7th, 2007 5:31 pm, "ness My sister is following this story closely. She has never done anything about it. It was a big deal when it happened. Afterwards he passed out and my sister left and took his pistol. If he reads this he will know exactley who we are. Which may not be a good thing. There were many of the officers involved in retreiving the gun and it was kept below the radar screen. She was a young teen when this happened. So it was hard to report something like this to the police when some were involved." 2007-11-30 chicagotribune.com Peterson wants his stuff back ILL 12/01/2007 (Chicago Tribune) "Peterson wants his stuff back"
"Attorneys for Drew Peterson filed a motion Friday in Will County seeking the return of Peterson's property seized by Illinois State Police as part of the investigation into the disappearance of Peterson's fourth wife, Stacy. Among items taken Nov. 1 were Peterson's 11 guns, ammunition, two iPods, a backpack with school supplies, computers and 23 CDs, according to the motion. Police also took the couple's 2005 GMC Yukon Denali and 2002 Pontiac Grand Prix." Police-issued weapon ILL 12/11/2007 (cbs2chicago.com) "Source: Investigation Of Shooting At Peterson Home"
"As CBS 2 West Suburban Bureau Chief Mike Puccinell reports, police investigators have been looking into a shooting that sources say occurred inside the Peterson home several months before Stacy Peterson disappeared. At the time, sources say, Stacy Peterson was in the garage getting a soda at the request of her husband. 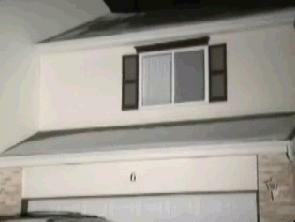 Drew Peterson was in the master bedroom above the garage when his gun fired. The bullet reportedly went through the floor and slammed into the concrete garage floor about a foot behind where the young mother was standing. A source says Drew Peterson claimed it was an accident involving his police-issued weapon. The source also says then-Sergeant Peterson never reported the shooting to authorities." "CBS2 has also learned that investigators are looking into reports that former Sgt. Peterson may have blown off a police issued flash bang grenade on the Fourth of July two years ago." December 11, 2007 Stacy showed Cassandra bullet hole ILL www.findstacypeterson.com forum posting by "GuardianAngel", Global Moderator, Full Member, Posts: 286, Thread titled, "Re: CBS 2 CHICAGO - SHOTS FIRED IN HOME!" Reply #17 on: Today [12/11/2007] at 10:12:24 PM, Quote, "I Saw The Bullethole....Stacy Peeled The Carpet Apart To Show Me..... Then She Also Showed Me The Patch On The Ceiling Of Drywall Where...Drew Had Patched The Hole"
December 1, 2007 Will Drew get his guns back? Judge Dan Rozek will decide 12/12/2008 ILL 12/1/2007 (cbs2chicago.com) "Police: Truckers Asked To Deliver Peterson Package"
Brodsky has insisted reports about the large blue container taken from the Peterson home are false. He has said the barrel never existed. Brodsky has also asked a judge to order investigators to return property seized from the family's home last month. The items include two cars, 11 guns, iPods, school supplies, computers and nearly two-dozen CDs. Will County Judge Dan Rozek is to consider the matter Dec. 12. Brodsky says Drew Peterson is entitled to his weapons, which were taken from a locked safe Nov. 1. "He certainly must feel the hate -- or dislike -- out there for him," Brodsky told The (Joliet) Herald-News. "I can understand why he feels safer if he has his weapons with him in the house, at least." December 12, 2007 Could guns present danger if cops arrest? ILL 12/12/2007 abclocal.go.com VIDEO: "Stacy's Family mets with Investigators"
Stacey Baca (abclocal.go.com) reporting: "Peterson also wants his guns returned. Earlier today reporters ask if the guns could present a danger to the police if they came back to arrest him one day. Drew Peterson's voice on the video: "It's a possibility, sure." December 12, 2007 Prosecutors want SUV, Grand Prix, guns and backpack ILL 12/11/2007 (Chicago Tribune) Stacy Peterson's sister tells of gunshot in home"
"A hearing was scheduled for Wednesday [12/12/2007] on Brodsky's motion to have items seized by police -- including Peterson's vehicles and 11 guns -- returned to his client. Prosecutors filed a response Tuesday, saying they had no objection to returning two iPods and 23 music CDs seized last month, but argued they have the right to retain custody of the GMC Yukon Denali SUV and Pontiac Grand Prix, the guns, computers and a backpack containing items of Stacy's." December 12, 2007 Judge Rozak says he'll decide gun issue on Monday 12/17/07 ILL 12/12/2007 (Chicago Tribune) "Peterson says wife shot gun"
"A Will County Circuit Court judge said today that he will decide Monday whether to grant Drew Peterson's request to have his two vehicles, 11 firearms and other items seized by police returned to him. At a 20-minute hearing, Presiding Judge Daniel Rozak listened to arguments from the defense and prosecution before saying he would study case law before rendering a verdict. Defense attorney John Carroll, who has joined Joel Brodsky in representing Peterson, a suspect in the disappearance of his fourth wife, Stacy Peterson, told Rozak that police have had sufficient time to analyze the seized property and that authorities are withholding the items to vex Peterson." "Drew Peterson on Wednesday said a gunshot in his home in the summer resulted from his wife, Stacy, accidentally firing the handgun he gave her as a present. "It was an accidental discharge—in my home by Stacy," Peterson said in an interview at their Bolingbrook home. "She had a fascination with guns. I bought her a Glock for Valentine's [Day]—because nothing says I love you like a Glock. That was our joke." December 12, 2007 Pamela Bosco says she believes Cassandra regarding the gun incident ILL KATHY CHANEY, "CHICAGO DEFENDER": Well, Cassandra Cales, Stacy`s stepsister, said that she did report the incident to the police after Stacy went missing, but it`s just now coming out in media reports. - PAT LALAMA, GUEST HOST: And Pam Bosco, Stacy Peterson`s family friend and spokesperson, did you know about this? - PAM BOSCO, STACY PETERSON FAMILY FRIEND AND SPOKESPERSON: No, I didn`t, actually. I was made aware of it just recently. - LALAMA: And what`s your reaction to it? - BOSCO: You know, everything Cassandra says, I believe in. And she obviously told Illinois State Police for a reason, and this obviously (INAUDIBLE) for them to do with the investigation on it now. December 12, 2007 Brodsky says Stacy was embarrassed to reported gun incident ILL JOEL BRODSKY, ATTORNEY FOR DREW PETERSON: Well, first of all, after speaking to Drew, what really happened was this. Drew bought Stacy a Glock, a .9-millimeter Glock, as a present. Stacy used to like to handle the gun from time to time. She was up in the bedroom handling the gun and it actually discharged, striking the floor. She was embarrassed. Nobody called the police because she was embarrassed. She was -- and so that`s what really happened. But more than that. December 12, 2007 Pamela Bosco says Brodsky's explanation on Stacy and gun incident is an idiotic statement ILL PAM BOSCO, STACY PETERSON FAMILY FRIEND AND SPOKESPERSON: That has to be the most idiotic statement and explanation I have heard to date. I need to know, did Drew, was he trying to teach Stacy at that point how to shoot a gun in the house with children around? Or do the guns just lying around where Stacy actually had that gun in her hand and she accidentally shot it off? Where is the common sense behind that statement? And I`d want to know why a police officer, and Drew, who knew the were children were in the house, would actually allow his wife -- and Stacy, being the mother as we know her, would play with a gun in the house with children around -- that is beyond reason. It is beyond belief. December 12, 2007 Brodsky says police already checked bullet hole ILL JOEL BRODSKY, ATTORNEY FOR DREW PETERSON: Absolutely. It`s hearsay. It`s a violation of the confrontation clause, so it would never make it into court. And I believe the police have already checked it out. They`ve had three -- two full searches of the house. I know that they`ve looked at that bullet hole. They know the caliber of it, and they knew what Drew`s service revolver caliber is. So this has already been checked out. December 13, 2007 Carcerano says it was Stacy who fired the gun ILL STEVE CARCERANO, FRIEND OF DREW PETERSON: The incident that happened up in the bedroom was Stacy did fire the gun, and it was an accidental shooting into the floor. I actually went over there yesterday and took a look at the garage and saw the bullet hole in the ceiling. I think the story that we heard was that Cassandra said that Stacy told her that Drew shot the gun off, and before shooting the gun off, he asked her to go downstairs and get him a can of beer in the garage, and then the gun went off. But that`s not true at all. December 13, 2007 Anthony Laatz runs Stacy's web site says he doesn't believe Stacy would fire a gun in the house ILL PAT LALAMA, GUEST HOST: We have a new guest now, Anthony Laatz, Stacy Peterson`s family friend. And you also run the Web site. And thank you so much for being with us. What do you make of Stacy on a motorcycle in a bikini top? Let`s start with that one. - ANTHONY LAATZ, STACY PETERSON FAMILY FRIEND: I don`t believe that has happened. I`m sure it`s just another ploy to discredit Stacy and her personality. - LALAMA: Was she in the habit of running around on a motorcycle with a bikini top? - LAATZ: Not that I know of. - LALAMA: And what about the gun, Anthony, and this firing of the gun in the house? - LAATZ: I don`t believe that she would have fired the gun. She wasn`t all that interested in playing with guns. - LALAMA: You know what, Anthony? Let me interrupt right there, did she ever say to you, I have a fascination with guns? - LAATZ: No. - LALAMA: All right. So, is this all a big surprise to you to hear this? - LAATZ: Yes, it is. December 13, 2007 Carcerano says Stacy had a gun license ILL STEVE CARCERANO, FRIEND OF DREW PETERSON: "Absolutely. I had seen her at the end of September pull- up in front of my house. I had a 25-minute conversation with her with her bikini top on. Not only that though, she did have an arms card that was licensed with the state in terms of the gun. So you know, maybe her sister Cassandra might have known about that. Maybe this Anthony doesn`t know that." "Judge Rosek's a good guy," Peterson said. "I've known him for many years, and I'm sure he's making the best decision for all concerned." Judge denies Peterson get his guns back ILL 12/17/2007 (cbs2chicago.com) "Peterson Loses Bid To Get Back Seized Possessions"
"Drew Peterson will have to do without his guns and cars a little while longer after a judge denied his request to get those items back from police. Peterson says he wanted those items returned -- in particular his vehicles and a computer -- because it's been a financial strain on his family to have to rent a minivan and buy a new computer." "BS 2 West Suburban Bureau Chief Mike Puccinelli reports that a Will County judge ruled Monday that police can keep those seized items as evidence. Drew Peterson said Monday night he is OK with that. "Judge Rosek's a good guy," Peterson said. "I've known him for many years, and I'm sure he's making the best decision for all concerned." Drew Peterson was not present for Monday's hearing, which was over in a matter of minutes. The ruling means Peterson won't be getting his guns or cars back anytime soon." New date for court to decide on Peterson's guns, cars and computers ILL "The state still has Drew Peterson’s cars, guns and computers. But Will County Judge Richard Schoenstedt soon will decide if everything will be returned to the retired Bolingbrook police officer — or not." - "Joel Brodsky, Peterson’s Chicago-based lawyer, came to Schoenstedt’s courtroom Friday morning to see if the judge would release everything else. Peterson did not appear in court. During the brief hearing, Schoenstedt decided that Will County Assistant State’s Attorney John Connor and District 5 State Police Commander Ken Kaupas could meet privately with him Friday morning to explain why they wanted to keep Peterson’s property. At 9:30 a.m. Feb. 1, Brodsky will tell his side of the story in open court. Then the judge will decide what to do with the cars, guns and computers." Issue to continue 02/27/08 ILL 02/01/2008 (chicagotribune.com) "Drew Peterson brings in expert in bid to get items back"
"Drew Peterson and his attorney hired a former Michigan State Police forensic scientist to argue Friday before a Will County judge that there has been ample time for Peterson's seized vehicles, guns and other items to be analyzed and that they should be returned. Ann Chamberlain, now with Speckin Forensic Laboratories, told Judge Richard Schoenstedt that evidence technicians generally need only days to process automobiles, guns and computers and that returning them should not hamper the investigation into Peterson's wife's disappearance. At issue is a motion filed in December by Peterson's attorney, Joel Brodsky, asking that the court order police to return two vehicles, 11 guns, computers and other items seized as part of a search warrant." "Assistant State's Atty. John Connor countered that the law does not require officials to continually explain their reasons for keeping items seized via search warrant. He cautioned that if Schoenstedt orders the items returned, "every defendant will be in here trying to get their stuff back." "Under cross examination, Chamberlain said she had never seen a computer seized as evidence returned to a suspect before charges were filed, but recalled a recent case in which a vehicle was returned to a suspect later charged with murder." "Peterson must agree not to challenge the validity of photographs of the property or documents related to them at any future trial" Items must be returned within 30 days ILL 02/27/2008 (myfoxchicago.com) "Judge: Drew Peterson's Property Must be Returned"
"Joliet, IL. -- A Will County judge says investigators must return to Call items seized from his home within 30 days. The investigators took the property -- including guns and computers -- in November as they investigated the disappearance of Peterson's wife, Stacy. Judge Richard Schoenstedt made the ruling during a morning hearing. The only condition is that Peterson must agree not to challenge the validity of photographs of the property or documents related to them at any future trial. The former Bolingbrook police officer has been named a suspect in Stacy Peterson's October disappearance. He hasn't been charged with any crime and denies having anything to do with her disappearance." Internet Forum posting found from unknown individual Peterson has to provide valid gun card ILL 02/27/2008 "OPEN THREAD….. BUT THIS OPEN THREAD INCLUDES A JOB FOR YOU!" From WBBM AM radio. Also, DP has to appear before judge to show valid gun card. Maybe as early as Mar.17th. Same date as the Savio case and reopening the KS estate. Reporter from WBBM said live on radio that they are going to try and revoke the gun card." "won’t get any of his property back until after Peterson appears in court next month." ILL 02/27/2008 (SunTimes) "Judge: Drew can have possessions back after court appearance"
"But Judge Richard Schoenstedt ruled that the ex-Bolingbrook cop won’t get any of his property back until after Peterson appears in court next month. Schoenstedt said he wants to personally explain to Peterson the terms of his court order, which would bar Peterson — if he is ever charged — from challenging the validity of photos and other documents relating to the seized property. Peterson’s attorney said after the hearing that those terms are acceptable." "But Will County prosecutors don’t want Peterson to get back the 11 guns taken from his home. Will County State’s Attorney James Glasgow has filed a letter asking Illinois State Police to revoke Peterson’s firearm owners identification card, though a spokesman wouldn’t say why Glasgow wants the card pulled. Under the terms of the court order, revoking the FOID card would bar Peterson from getting the firearms back." "He [Joel Brodsky] said [Drew] Peterson has both state and federal licenses to carry firearms." Illinois State Police asking that Peterson's FOID card be revoked ILL 02/27/2008 (chicagotribune.com) "Drew Peterson may regain items seized by police"
"On Feb. 1, Schoenstedt heard testimony from former Michigan State Police forensic scientist Ann Chamberlain, who said that in most cases investigators can complete their analysis of physical evidence within days. She said that returning items should not hamper a criminal investigation. In court Wednesday [02/27/2008], Will County Assistant State's Atty. John Connor told the judge his office has sent a letter to Illinois State Police asking that Peterson's FOID card be revoked. Chuck Pelkie, a spokesman for State's Atty. James Glasgow, confirmed the letter was sent Tuesday [02/26/2008] but would not elaborate on the basis for the request. Brodsky said it was the first time he had heard of the letter and he doubted police would find any cause to have the card revoked. He said Peterson has both state and federal licenses to carry firearms." "I knew that was coming," "Just another pain in the [rear]." ILL 02/27/2008 (chicagotribune.com) "Drew Peterson's gun card revoked"
"State police revoked Drew Peterson's firearm permit Wednesday, just hours after a Will County judge ordered officials to return guns and other items to the former Bolingbrook police sergeant. State's Atty. James Glasgow sent a written request Tuesday to Larry Trent, state police director, for the revocation of Peterson's Firearm Owner's Identification card, officials said. By Wednesday evening, the state's attorney's office confirmed the card had been revoked. The move put a damper on an otherwise victorious day for Peterson. "I knew that was coming," Peterson said from New York City, where he was scheduled to appear Thursday on the "Today" show. "Just another pain in the [rear]." "Schoenstedt said he would decide on March 17 whether the two sides have issues to iron out and to admonish Peterson in person as to his responsibility. If both sides are in agreement, the property would be returned by March 28. State's attorney's office spokesman Charles Pelkie, who called the judge's order reasonable, would not elaborate on reasons used to revoke Peterson's FOID card." February 27, 2008 "Peterson poses no danger and he believes police are simply trying to irritate his client." ILL 02/27/2008 (chicagotribune.com) "Drew Peterson's gun card revoked"
"Attorney Joel Brodsky said Peterson poses no danger and he believes police are simply trying to irritate his client. "I've called the state's attorney, and Drew has specifically said to the state police that if there's ever a warrant out for him, that they should call me and we'll walk in," Brodsky said. "I think it's more vexatious behavior. I don't think it's the state's attorney, but rather the state police, and I think it's a fairly sad commentary that they're trying to avoid compliance with a court order for no valid reason. I mean, if there was a reason to revoke Drew's FOID card, you figure they could have done it a long time ago." "Both sides agreed to come to court at 9:30 a.m. March 17 so the judge could check the status of the proceedings." "If Drew Peterson wants his cars, guns and computers, he's got to come to court. And he'll have to speak to Will County Judge Richard Schoenstedt." ILL 02/28/2008 (www.suburbanchicagonews.com) "Conditions put on Peterson request"
"If Drew Peterson wants his cars, guns and computers, he's got to come to court. And he'll have to speak to Will County Judge Richard Schoenstedt. The judge announced that news Wednesday [02/27/2008] morning during a brief hearing." - "At the conclusion of that hearing, Schoenstedt said he wanted to think about the issue and would announce his decision at a later date." "If Peterson's agrees to his conditions, he can have his property, the judge said. But the state will take photographs of the cars, guns and computers to use in a trial if any charges ever are filed against Peterson -- or anyone else -- in connection to the disappearance of Stacy Peterson, the judge said. The state also will copy the information on the hard drive of the computers to use as evidence in any future trial, Schoenstedt said. Additionally, Peterson must agree that he won't challenge the validity of the photographs or the copies of the hard drives if charges are filed, Schoenstedt said. But nothing will be returned if Peterson doesn't come to his courtroom and agree to the conditions, Schoenstedt said."